To remain relevant, one must find new and meaningful ways in which to show up in the world. With our 35-year anniversary late last year, it was time for our studio to revisit our dated branding and web presence — and time to create a new image that mirrors where Civitas is going. Our studio collaborated with (in)spiregraphics, a Denver-based marketing and design boutique, to help guide this entire rebranding and web development process. They studied us in our native habitat; they sat in on meetings; they asked us questions about how we define Civitas; and dug deep into what makes us unique. We shared our history, as well as where we hope to go. And all of this info helped forge a new aesthetic. The final logotype falls into a square, with the cleanly formed letters just swelling outside of the visible frame. This notion communicates that we’re bigger than what fits into a box. It’s architectural, it’s balanced, and it even works phonetically. It’s both complex and simple, demonstrating who we are and who we’ve yet to become. Our new palette is timeless and based in precision; visible through the use of black, white and the softest of grays. This process extended through to the creation of a completely redesigned website. Big images, compelling narrative, a feature-rich layout paired with an interactive user experience brought renewed depth and focus to our web presence. 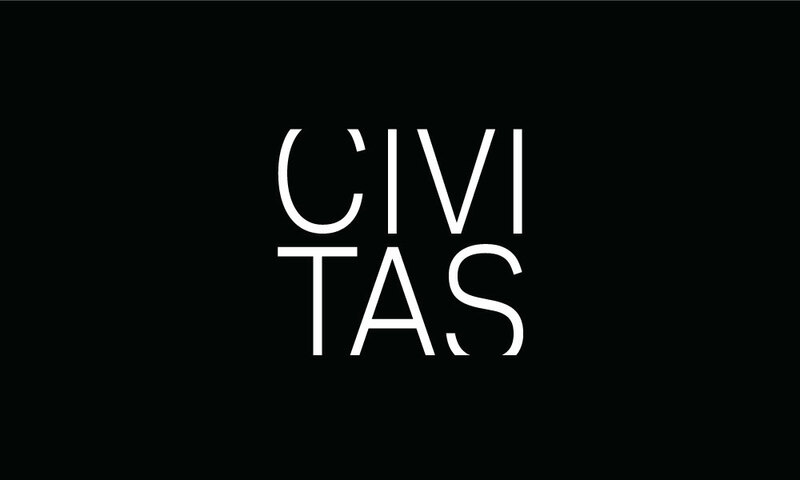 Everything seamlessly fused with the new branding, and we launched all of this on the day Civitas turned 35. Come check us out!